Starting on November 19, GameStop will be starting signups for Power Pass, a new in-store game rental service that will allow people to take home pre-owned games as rentals. Paying $60 up front gets players unlimited rentals for six months, with a few caveats. Power Pass is only available to PowerUp Rewards members, and though there are paid tiers of the PowerUp Rewards Program, even the free signup for a PowerUp Rewards account will grant access to the Power Pass rental service. Once subscribed to Power Pass, members can take home any pre-owned game from a brick and mortar GameStop, swapping out for another whenever they want a new title. At the end of the six month period, members get to keep the last game that they checked out. 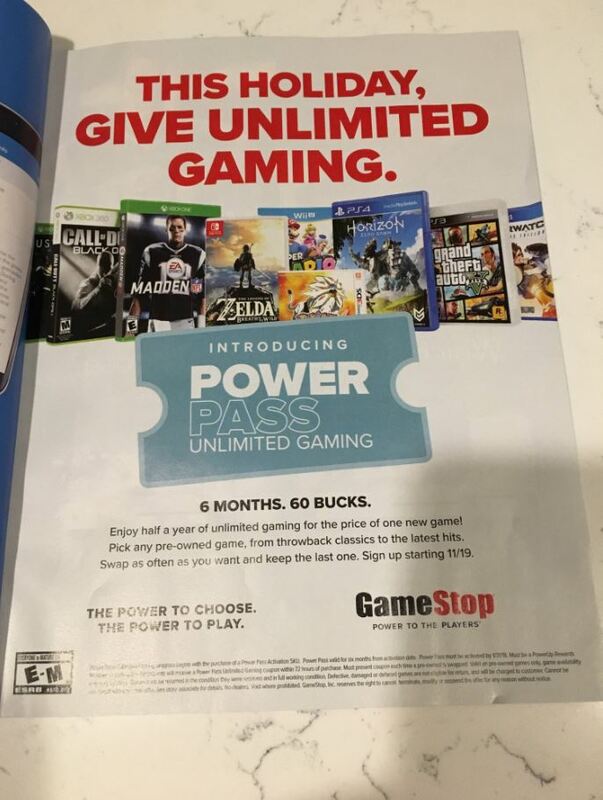 The GameStop Power Pass is an interesting move for the company to get gamers into its stores. Players have to visit a GameStop location to pick up the game, and it gets them browsing the selection of titles available. It might seem like an outdated service (Mashable compares it to the likes of Blockbuster), but it’s actually much cheaper than Gamefly–a rental service that will mail you new games–for the same period of time. It’s also important to note that Gamefly doesn’t let you keep a game once the subscription has ended. GameStop has had a tumultuous year, from an earnings decline in 2017’s second quarter, to an announcing they will be open on Thanksgiving this year, to a lot of kickback regarding the Circle of Life program that dictated how employees needed to sell new, used, and pre-order games in each store. The announcement of the GameStop Power Pass is a clear shift in strategy as brick and mortar video game stores keep finding it more and more difficult to keep up with the advent of digital games. Are you interested in signing up for the GameStop Power Pass?